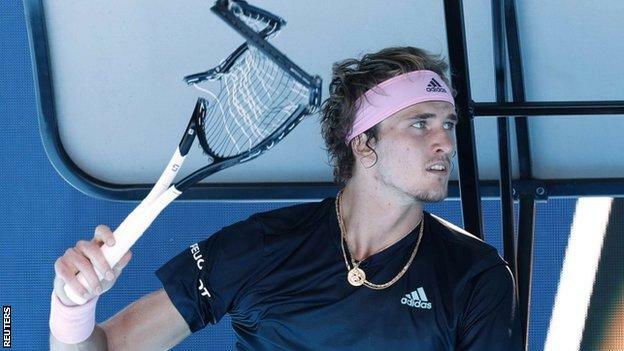 World number four Alexander Zverev was comprehensively beaten by Canada's Milos Raonic in the fourth round of the Australian Open. The German, widely seen as a top contender for the title after his stunning ATP Finals win in November, lost 6-1 6-1 7-6 (7-5). While Zverev, 21, destroyed one racquet in a spectacular meltdown in the second set, Raonic remained calm to win. The 16th seed will face Croatia's Borna Coric or Frenchman Lucas Pouille next. "I just tried to stay composed," Raonic said. "It worked extremely well for me today. "I played incredibly good, did a lot of things extremely well." Zverev had started the match in dream fashion, breaking the big-serving Raonic in the first game. But that was the only positive as he went on to lose eight games in a row. His serve deserted him, particularly his second serve on which he won just 25% of his points in the first set and 20% in the second. He briefly stopped the rot with a hold in the third game of the second set before losing the next five games. He frequently shrugged in disbelief at what was happening and his frustration boiled over at the changeover when he had been broken to trail 4-1 in the second. Sitting in his chair, he repeatedly battered one side of his racquet into the ground, pausing only to swap sides and ensure only a heap of bent metal and torn strings remained. A new racquet did not help, though, even if his serve percentages improved in the third set and he showed glimpses of his best to save two match points at 5-4. If he had played more of the tennis he displayed in the 29-shot rally that ended with a beautiful backhand slice that Raonic could not return on one of those match points, it might have been a different story. But, although he forced a tie-break, and won two points on the Raonic serve in it, his time was up when the Canadian hit a forehand cross-court winner on his fourth match point. Zverev's stunning victory over world number one Novak Djokovic to win the title at the prestigious ATP Finals last year had suggested 2019 would be the year that he made some serious impact on a Grand Slam. But he still has only one major quarter-final to his name in 15 appearances - at last year's French Open - and this display raises questions about his maturity and mentality under pressure. By the same age as Zverev, 17-time Grand Slam champion Rafael Nadal had won three French Open titles. He had already shown signs that this was not going to be his breakthrough tournament when was taken to five sets by Jeremy Chardy in the second round having let slip a two-set lead. Against Raonic he served up 10 double faults and managed only 21 winners, compared to 45 for the Canadian. Coupled with a code violation for the racquet smash, this performance did not point to a potential successor to players like Nadal, Djokovic and 20-time Grand Slam champion Roger Federer.